The First World War ended with the break-up of the Austro-Hungarian Empire. The Dual Monarchy came out of the conflict it has caused split in half, with its two constituent parts permanently separated. Moreover, these territories themselves were in turn broken up, giving birth to other, smaller independent states. ln the end, Austria and Germany were denied their ultimate goal: Anschluss- the unification in a single German state. Below you have a timeline of the last days of the Austro-Hungarian Empire, the last autumn before the once great European empire collapsed. September 29: Major offensives by the Entente on the Western Front; consequently, Erich Ludendorff urged the government to immediately begin negotiations to end military operations. Bulgaria, allied with the Central Powers, signed an armistice. On the Italian front, the Dual Monarchy troops are reeling from hunger, lack of military supplies, exhaustion, and desertions. October 6: The creation of the National Council of Slovenes, Croats and Serbs. The Royal Hungarian Government in Budapest loses its authority in Zagreb. October 16: Emperor Charles I of Austria signs the “Völkermanifest” (The Peoples Manifesto), through which the empire was transformed into a federation of autonomous national states. But the goal of politicians from among the other nationalities was not autonomy, but sovereignty. October 21: German members of the Austrian House of Representatives, elected in 1911, created in Vienna the Provisional National Assembly for German Austria. October 24: The government in Vienna lost its authority, some of its decisions are no longer respected. Hungary’s diet in Budapest announced, with the consent of King Charles IV, the Hungarian Government’s proposal, led by Sándor Wekerle, to end the Austro-Hungarian compromise of 1867 on 31 October 1918. The last ministerial council meeting for common affairs is held. October 26: Emperor Charles I formally ends the alliance with the German Empire. October 27: Appointment of the “Liquidation Government” by Lammasch in Vienna. Its members took the oath of allegiance a few days later. October 28: The Czechoslovak National Council took over the administration of Bohemia from the Austrian representative in Prague. The creation of the independent Czechoslovak state. October 29: The National Council of Moravia took over military command from Austrian representatives in Brno, Czech Republic. The Croatian diet (Sabor) announced Croatia’s separation from Austria-Hungary. The State of Slovenes, Croats, and Serbs was proclaimed in Zagreb, which claimed all South Slavic territories that had formerly belonged to the Dual Monarchy. The Slovenian National Council declared at Ljubljana that all Austrian territories inhabited by Slovenes are independent. October 30: The Provisional National Assembly for German Austria establishes its first cabinet, an act by which German Austria is constituted as a state; Karl Renner becomes chancellor. The Czechoslovak National Committee takes over military command in Prague, Plzeň and Litoměřice from Austrian authorities. October 31: The Ljubljana National Council proclaims Slovenia’s entry into the Slovenian, Croatian, and Serbian state. South Slav officers take command of the Imperial and Royal Navy. The Central Romanian National Council is set up in Budapest. Former Prime Minister István Tisza is killed in Budapest on the first day of the Chrysanthemum Revolution. November 1: The Lammasch cabinet in Vienna began to hand over power to the new Austro-German cabinet led by Renner. The administration of Bosnia was handed over to the Bosnian National Council. The police chiefs of Vienna swore an oath to the Staatsrat. November 2: The order of Bela Linder, the new defence minister in the Hungarian revolutionary government led by Mihály Károlyi, to the Hungarian regiments on the Italian front to cease all hostilities, was officially transmitted to the troops by Austria-Hungary’s Army Higher Command. The last foreign minister of the empire resigned, Gyula Andrássy the Younger. November 3/4: The armistice of Villa Giusti, signed near Padua between the Austro-Hungarian armed forces and the Entente. The armistice’s entry into force, which according to the Austrian-Hungarian army expectations would have been “immediate”, was interpreted differently by the parties involved in the conflict; this allowed the Italian forces to take over one hundred thousand troops prisoner in the last 24 hours of the conflict. Italy occupied South Tyrol, Trier and the Austrian Littoral. The last joint finance minister, Alexander Spitzmüller, resigned. November 9: The Central Romanian National Council calls on the new Hungarian revolutionary government headed by Mihály Károlyi to be given full power of government over the territories inhabited by Romanians in Transylvania. November 10: The Kingdom of Romania declares war on the Central Powers and Romanian troops cross the Carpathians once more. November 11: Emperor Charles I leaves for German Austria; dissolution of the Lammasch government, the release of all public servants of their oath to the emperor. The last minister of war resigns, Rudolf Stöger-Steiner von Steinstätten. November 12: By the decision of the Provisional National Assembly, the State of German Austria proclaimed itself a part of the Republic of Weimar. The Delegations and the House of Lords of the Imperial Council as well as the k. u. k. and k. k. ministries were abolished. November 13: King Charles IV of Hungary renounces the throne. The Hungarian government, which did not consider itself committed to the armistice that was in force since November 3/4, as Hungary revoked its personal union with Austria at the end of October, concluded a military convention with the Entente in Belgrade, whereby it had to accept conditions even worse than those imposed on Villa Giusti. November 14: Tomáš Garrigue Masaryk, still in exile, was elected President of the Czechoslovak Republic. His appointment through the intercession of other exiled Czech politicians in Paris had been decided since October 24. November 16: Hungary declares itself a republic, the first president being Mihály Károlyi. 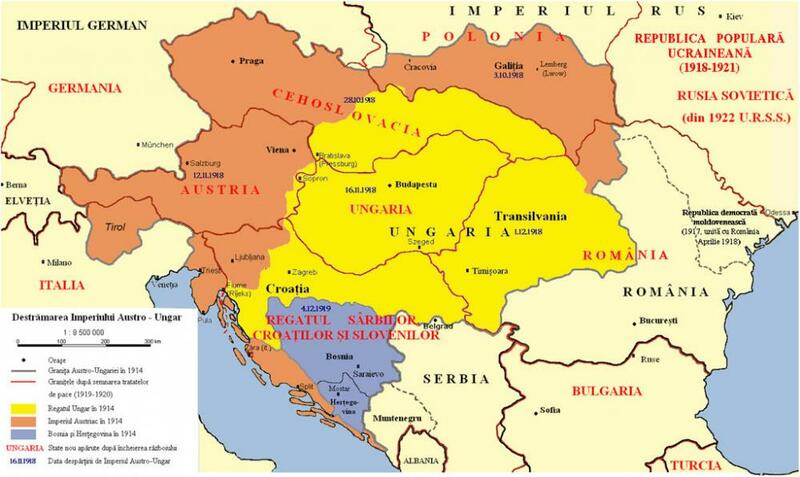 November 28: Bukovina, with the disintegration of Cisleithania underway, demands unification with the Kingdom of Romania.